Engineered specifically for troubleshooting Variable Frequency Drives and Power Inverters the Talon VFD / Inverter Meter is your key to positive results. Not only that, this meter is easier to use than a standard multi-meter and can save more money than it costs the very first time you use it to fix a piece of equipment instead of replacing it. Variable Frequency Drives, Spindle Drives, Servo Drives, or anything with power modules. Components, Circuits, Modules, and any other like devices. Transistors, IGBT's, FET's, Bi-Polar Junction Transistors, SCR's, Triac's, Resistors, Capacitors, Diodes, and more. 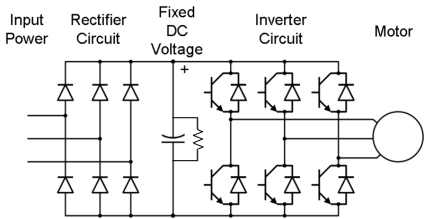 1 - Voltage in (AC) is transformed into DC by Diodes in the Rectifier Circuit. 2 - Fixed DC Voltage is stored in a large Capacitor. 3 - Drive wave form is created by the Inverter Circuit with IGBT Modules. With the Talon VFD / Inverter Meter and our troubleshooting guide, you have the ability to test everything in all of the stages above without removing any components. If the Rectifier Circuit diodes are bad, it will tell you. If the Capacitor or Resistor in the Fixed DC Voltage stage is bad, it will tell you. Most important, it will test each of the IGBT's/Modules in the output stage and tell you good or bad, this is the most common failure. You have a VFD or Inverter that has stopped working. The first thing you do is open the cover, check for loose or disconnected wires, and check the fuses. No problems there, that means a component or module has probably failed. You call up and get the price for a new drive, $1987.00, OUCH!! It would be less expensive for you to spend about an hour to repair this one. You pull out your Talon Meter and follow the directions in the easy to use troubleshooting guide. - Identify the bank of power modules. - Connect the Talon Meter leads to the first module and get readings. It does not matter how you arrange the test leads, you do not have to know the module layout. - Hook it up the same way to other modules and record results. - Compare results to identify suspects - Use it the same way for other components as well. - Remove the suspect component and test for good / bad confirmation. - Order parts and fix the drive yourself. Only $679.00 - discounts available for multiple unit orders. BUY IT NOW ON EBAY! Interested in becoming a distributor of this product? - Territories available - Contact us today!